From the Warsaw Ghetto to Sarajevo, the international community has too often failed victims of mass atrocities. Now, Frédéric Mégret is exploring how the globalization of law can embolden the spirit of resistance—and prevent genocides. Is the pen mightier than the sword? McGill law professor Frédéric Mégret, who has wielded both, believes the old adage. As a UN Protection Force peacekeeper with the French army in 1995, Mégret witnessed the misery and suffering caused by the shells, snipers and starvation ravaging Sarajevo—and, when his eyes met those of the Bosnians he was trying to protect, he felt “the embarrassment of not being able to do much.” Mégret didn’t need front-line experience to know that something had to be done to stop ethnic cleansing (“That wasn’t a revelation”), but his tour of duty did open his eyes to how the UN works—and how it doesn’t work. The experience informs his current research on how the globalization of law can empower individuals and social groups to better resist violence. 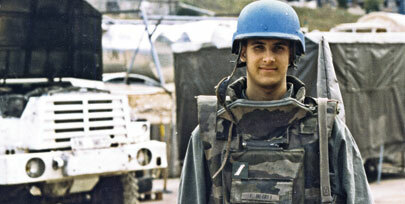 Frédéric Mégret's tour as a UN peacekeeper in Sarajevo (below) made him keenly aware of the limitations of international law. Mégret is engaged in a long-term, SSHRC-funded research project on the tradition of resistance to oppression and tyranny, trying to recast resistance in light of current international legal developments. The goal is to empower people who are caught in conflicts or situations where there is no real prospect of a local judicial remedy, where democracy is non-existent and where the international community is unlikely to intervene. International law, Mégret argues, could provide a more solid normative base to those who seek to resist or even rebel against their state. “The ‘Nuremberg precedent’—the idea that soldiers should disobey orders instructing them to commit atrocities—is something that can and should be extended to the general population,” he argues. The aim is not to create chaos and to destroy sovereignty; rather, international law should embolden individuals, in certain extreme circumstances, to take matters into their own hands by, for example, engaging in broad campaigns of civil disobedience. Mégret’s interest in how the law helps, or hinders, individual empowerment isn’t limited to the idea of resistance. Another of his research projects deals with how persons with physical or mental disabilities have been “massively discriminated against,” often as a consequence of the law itself. He is currently analyzing the UN Convention on the Rights of Persons with Disabilities, a landmark 2006 document which outlines the first-ever international standard for disabled people’s human rights. His thesis is that the way disability rights are conceived in the Convention—which is the most holistic and comprehensive treatment of the subject to date—has a lesson to teach about international human rights in general. “The Convention on Disabilities,” he says, “can also help us think about the ways in which human rights are universal—the same for all—yet need to take into account the irreducible experience of certain categories of human beings. 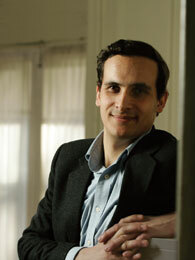 Frédéric Mégret is the Canada Research Chair in the Law of Human Rights and Social Diversity.